When the Soviet system collapsed and the money ran out, Belarus declared the end of the accident, Chernobyl as something to be memorialized in a museum. Well, Japan is well ahead of Belarus and Russia. They already want to memorialize the Fukushima accident by building a museum, “lest the memory of the accident fades away”. It doesn’t matter to them if their accident is still on-going. Doctor Dörte Siedentopf organizes recreation stays since 20 years for Chernobyl children. She is bewildered about how to deal with Fukushima. 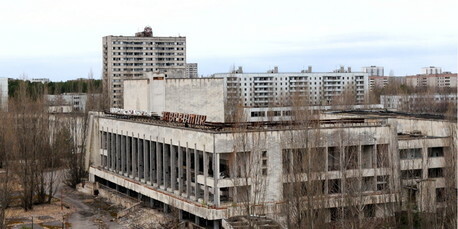 Ghost town of Pripyat in the Ukraine: The residents were forever evacuated after the disaster. Dr. med. Dörte Siedentopf, born in 1942 in Oldenburg, school attendance and high school there, and from 1961 studied medicine in Würzburg, Berlin, Göttingen. 1966 examination, promotion 1968, 1967 marriage, two children, from 1970 in Hesse Dietzenbach own medical practice as a general practitioner and psychotherapy in a group practice. Retired since 2003. She is (since its foundation in 1981) a member of the IPPNW (International Physicians for the Prevention of Nuclear War, doctors in social responsibility). She initiated the installation of “stumbling blocks” in Dietzenbach and founded in the early 90s, the “Circle of Friends Kostjukovitschi e. V. Dietzenbach” that besdides other activities, sends relief shipments to Belarus twice a year, with medical equipment, clothing, bicycles, sewing machines, computers, etc. Since 20 years, recovery stays in Germany are organized for children of Chernobyl. Hospitable Dietzenbacher families accomodate White Russian children every summer. The Circle of Friends now has many members and many friends in Kostjukovitschi. A number of active helpers for the Circle of friends takes care of everything, even to the collection of monetary and material donations. Since 2009, the 23 Anniversary of Chernobyl, there exists a town twinning. Dr. Siedentopf is married to a physician, both children have studied medicine. Her father was a country doctor, her mother a housewife and a teacher. Dr. Siedentopf welcomes us into her small rooftop apartment in early December in Berlin Pankow in proximity of a park. Over tea and biscuits, she tells us about her relief activities and experiences. “The worst thing is that the organizers have nothing learned from Chernobyl. I’m speechless over the handling of the nuclear disaster in Fukushima, which is still larger than that of Chernobyl. About the fact that the government’s did not increase the evacuation zone accordingly, and women and children have not brought immediately to the south of the country to safety, one can only feel helpless rage. Instead, the population is systematically lied to, they are not at all or misinformed about the real dangers. This is completely irresponsible. What’s coming up now to the Japanese – diseases and problems- it’s unimagenable. And politics and nuclear industry really put up with everything! Worldwide! Using the example of Chernobyl, one can see approximately the dimension. Many people think that’s a long time ago, that Chernobyl is a bygone disaster that you can read about on Wikipedia. But the people in the radioactively contaminated areas from 1986 to today live with Chernobyl. The consequences do not yield. Unlike natural disasters, they increase with time – and for the next 300 years, at least. I’ll say more about that later” (See also the report of the” Society for Radiation Protection “and IPPNW:” The health consequences of Chernobyl, 20 years after the nuclear disaster “, note GG). People lived for decades in the contaminated area. “Before, I want to briefly say something about the causes and why we have decided to do relief efforts in Belarus. Most of the contaminated area lies in Belarus. 70 percent of the radioactivity came down on the former Soviet republic of Belarus. A quarter of the land area was contaminated. About 15 kilometers from the reactor,there’s the Belarusian border. And as the wind moved the cloud to Moscow, one has it forced to rain down artificially, with silver iodite. Of course without informing the population. In early May, with wonderful weather, suddenly a sticky, yellow rain came down, people say. One has left the population in the dark for years, there were only resettlements, orders, appeasement. Dosimeters were strictly forbidden. Particularly affected were the Gomel and Mogilev regions. In Mogilev region there’s the town Kostjukovitschi where I’ve been going to for 20 years. These two areas were contaminated at large area and about a million people had to be resettled, there had to bw built houses in the cities and counties to achieve this. Around Minsk, a huge city has been built. Many people lived ten years in the contaminated areas until they could move into new homes, and many still live on contaminated land and are farming. Since the demise of the Soviet Union, the Belarusian government has to pay for everything. In ‘our’ county alone, 8,000 people habe been resettled. 26 villages were demolished and buried. Many villages in the contaminated areas are empty, to some of them came back old people or war veterans returning from Chechnya or Afghanistan, who can not live in the city. There have happened been enormous changes . The costs for Belarus, including the health, were immense. The whole digging works thathave been made in the ten or fifteen years after Chernobyl, the decontamination of the Schoolyards,all the ablation – I don’t know where they have brought that. All that was payed by the State of Belarus. I think half of its budget has gone into the elimination of consequences of Chernobyl. And one day, one could not and would not meet the relatively generous rules from Soviet times any more. That is why President Lukashenko has declared Chernobyl as overcome, as a museum-like event. The formerly contaminated Belarusian areas present no more danger , was officially declared. Until 20 years after the disaster, there had still existed benefits, there was a so-called coffin money being paid to people who hada status as being liquidators. But as well people who were relocated had a claim. These payments were largely discontinued. It was not much money, but there was free medical care as well, which has now been abolished. And the recognition of certain diseases, as a result of Chernobyl, is no longer taken for granted. Nearly a million clean-up workers’ – mostly young men – were used at Chernobyl and its surroundings. A large part of them came from Belarus. Today, most liquidators are invalid, have lung and thyroid cancer, cardiovascular diseases, diseases of the kidneys, the gastrointestinal area, leukemia and even mental illness. Approximately 100,000 have so far died, aged between 40 and 50 years. Many committed suicide. Though it was simply told that Chernobyl is over. There have been protests in Minsk. And right now, there has been a protest in Kiev again, with a hunger strike by the liquidators, against the stark cuts that the Ukraine as well has made to pensions and benefits. In Belarus, for example,there was a the free kindergarden for the affected, the school food was free, the children also received special vitamins, and cures -the latter they even get it now, once per year, but otherwise everything was scaled back. as well the vitamin-rich food for the schools and kindergartens. So the identificaton card which they all have, they have shown us, does not account for anything actually. All former claims are deleted. If you already have very little and are sick as well, then the impact of the cuts and cuts is very high. Right now they have again – as every year – increased the local levies, ie water and heat. And the heat for the city, for the big houses and blocks, which runs in uninsulated pipes on the field during the winter, there’s a loss anyway that has to be paid as well. That is why many people prefer to live in the villages, where they can reduce their costs. The high public debt which restricts and oppresses all people is certainly on one hand caused by Chernobyl, but also by massive mismanagement. There is a hyper-inflation in Belarus, which is currently about 113 percent. The average salary is 150 to 300 euros a month. Working abroad is not allowed. The boundaries towards the new EU member states Poland, Latvia, Lithuania are tight for Belarusians. But it’s not just the money, the threat of state bankruptcy, there is also a tremendous inability to actually build up any in government at all within 20 years , in democracy. No opposition is tolerated. Yet it comes to protest demonstrations. As against the outrageous decision to build a nuclear plant. Belarus has no nuclear power plants. But immediately after Fukushima Lukashenko has said he wants to build one now, with Russian help, in Ostrowez, 20 km from the Lithuanian border. The contract has since been sealed by Lukashenko and Putin. It will cost more than 5 billion euros, the NPP is said to be modern and perfectly safe, clean and supply affordable energy and create jobs, all these propaganda stories. As the nuclear industry in East and West is the same. Dr. Siedentopf has picked up courage again and goes on:.. “We have looked at everything, the former ghetto as well. And by chance we five doctors from the group have visited a clinic outside of Minsk. There, children recovered that were treated for thyroid cancer. These were the first victims we saw, in a former convalescent home for officers. All the children were pale and with a red scar on the neck. Only then, we realized that Chernobyl is not over. A doctor then told us that reconciliation and understanding among nations could not really help so much, but that they need real medical help. If we wanted to help, we should go to the provinces, the major hospitals in Minsk were already relatively well supplied. The Frankfurt University Hospital was dedicated there. And we got an address and said we’d considerthis. And soon after two of us went to Kostjukovitschi. It is located about 180 kilometers in a straight line from Chernobyl, in the east of Belarus. My city Dietzenbach has 35,000 inhabitants, about as many as Kostjukovitschi. We visited the chief doctor there in an old hospital from 1905, it was incredible, barracks, spread on the ground, without anything. He showed us everything, and then we met the pregnant pharmacist Larissa, which is still our reliable contact woman and friend. She showed us the pharmacy, which was also very poorly equipped. There was a lack of dressing material, of expendable items. For children, it was said, there are no suppositories. She couldn’t produce itself, because she lacked the crude cocoa butter. And why you do not have eyes and ear drops? There is no dropper bottle, she said. And since then our project started, first with medical help. It was about the sequelae of Chernobyl, so as to be somewhat helpful. And with these people, the chief physician, the pharmacist and a pediatrician, we actually had a very intensive medical project during ten years. We have sent for the pharmacy project – or delivered – what was needed as substances. They have it processed there themselves. The children suppositories were then free or very cheaply made. Important assistance was also gynecological preparations, women’s suppositories. After ten years, this was no longer possible because the drug allocation was centralized, the pharmacies and retail were outlets only and not allowed to produce anything themselves. At that early time it had already begun that children were invited to Germany. In 1990 the first children were invited to rest stays in the GDR. They spoke russin and already had contacts. In 1991, it started with us. Our city said they will take over the financing for 50 children from the Chernobyl area for a vacation in the Taunus. But I said, let them take children and families from Kostjukovitschi as well and our families in Dietzenbach should also deal with the issue. And it was then made, the city financed it for two or three years and later our ‘Friends circle Kostjukovitschi e. V.’, who then was founded legally, so the donations we were able to settle properly. Families and children have become friends very quickly despite language difficulties and despite being a stranger. Many of these friendships have survived over the years. To date, more than 900 children and 250 adults were our guests in Dietzenbach . Many friendly return visits have taken place. And since then, I’ve been in Belarus about 40 times. From the first year we actually always have collected lacking objects for everyday life in this society of lack – in addition to medical assistance. At first at my practice, then later we got our own rooms. There were sent packets, twice yearly there are shipments by truck, we collected everything, clothes, bicycles, sewing machines, toys, musical instruments, computers, sports equipment, etc. We as well asked there what was needed, an art school wanted a kiln . A nursing home in a village needed everything: beds, mattresses, bedding, clothes, carpets, furniture, dishes, etc. We were very committed, there were also a furnishings for the doctor’s room who came to the village from time to time,deck, appliances. Or for pediatricians, we have sent stethoscopes and ear speculums that were missing, or specula with which one looks into the nose, things like that. Oh yes, we sent small mirrors, with which you look into the larynx, as well . But they were alwaysblind after already one year , and we asked what do they do with them. They were sterilized in the general sterilization and that made them blind. Then we have procured an own small sterilizer , and from there it went good. The following is the translation of the remaining part by the reader Florian Zschage. The original article in German is here. The Japanese translation is here. Now i want to talk about the health situation, which is normally not an issue here in Germany. It is important to understand the following: The more time goes by, the more catastrophic the situation for the people and all biological life in the region become. That’s what our media and our politicians don’t want to see, just as Lukaschenko, who declared the accident a thing of the past. After Chernobyl, multiple ‘waves of catastrophe’ occurred. The first affected the adults: the Liquidators, the physicians, people who went into the contaminated areas, and the people who lived there. Many of them died of cancer quiet fast. The children were affected from the beginning, too. In the affected regions of Belarus generally there is a general iodine deficiency, because there is no coastline as in Japan. Therefore the radioactive iodine was assimilated massively by the infantiles thyroid glands. After Chernobyl, the government decided to perform abortions on all pregnant women. But many mothers hid. In the year after the accident, many of those infants had thyroid cancer, too. An illness that was practically nonexistent for children. 4000 cases of thyroid cancer in Belarus are officially confirmed. Those had operations, received radiation therapy and take hormone medication for all their life, to not become cretins. And they would have to get this therapy for free – also for later ocurring dysfunctionalities – until today, 25 years after the accident, but they don’t. Nowadays in the succeeding generation we observe increased numbers of blood deseases. As we say: CHERNOBYL RAGES IN THE GENES. And that will continue for the next 300 years or so, because Strontium and Caesium has a half-life of 30 years, and as a general rule, after 10 half-life periods, no significant amount of these isotopes remain. That equals seven to eight generations. Plus the plutonium, which has a half-life of 24.000 years. Another problem is radiation induced diabetes for children and adults, especially in infants. A phenomenon that was unknown in the past. The government buys two kinds of insulin and all have to deal with that. But children need at least a third type of insulin and that type is not available, unless NGOs don’t take care of it. These NGOs also take care of the missing but necessary education.There are also eye diseases, opaqueness of the eye lens. And we saw an increase in breast cancer, many died within the first 5 years. One may ask oneself if radiation induced cancer is more aggressive than the “normal” one. The number of birth deformities also increased. Abortion is a big issue. Contraception costs money, and many people simply can’t afford it. That’s a big problem. On the other hand, there are many infertile couples. In Kostjukovitschi, 30 % of the couples are sterile involuntarily. Another issue is the increase in malignant tumors that occur ow in 6-, 7-, 8-, 9-year old children. Brain tumors. Bone tumors. Another big problem: In the contaminated areas, wounds didn’t heal properly anymore, it was dramatic. The reason for that is low immunity, because radioactive Strontium is incorporated in the bones and stays there. In the bones, human blood is created, and this way, it is irradiated continously during its formation. In a way, it is like AIDS: Immunisation doesn’t work anymore, because no antibodies are generated anymore.Therefore we have an increase of polio, despite immunisation efforts. Same with tuberculosis, the more, because the overall nutrition is bad. Many people watered their vegetables with rain water and they collect mushrooms and berries in autumn, which still are highly contaminated. The majority of the disabilities in children with mental or corporal handicaps in the region originate in radioactive radiation. One has to understand that the ovaries of women already exist in the woman’s own embryonic stadium. A big amount of cells become follicles, around 8 millions of them. All damage that happens to the mother inflicts these cells, too. The placenta has a natural barrier but unfortunately it is this barrier where radioactive particles do accumulate. The damaged egg cells can not be repaired. When a woman is born, there are still around 1-2 millions of them. During puberty, there are still 400.000. And those can be already damaged, when a pregnancy occurs. With all the consequences. One more thing is important to know: All those genetic damages, the cancer frequency and so on… those all are consequences of LOW DOSE RADIATION, and this is something completely different from the radiation disease of the liquidators. This is a fact that is contantly and continually denied by all persons in charge. The irradiation of vital organs is caused by incorporated radionuclides. If a cell is damaged, there are four possibilities for the cell. 1.: The cell dies instantaneously. 2.: The functionality of the cell is destroyed. 3. The cell degenerates and cancer occurs. 4.: The cell repairs itself. But this is only possible for adult cells. Cells in embryos have no such repair functions, children cells can’t do that either. For them it’s all about growing and dividing and only with time, the ability to repair themselves becomes existent. That’s one of the crucial factors why children are especially in danger. And this is why all pregnants and all children have to be evacuated from the Fukushima area immediately! The atomic industry in general is an issue that can’t be evaluated properly and finally, because so many economic interests are involved, so much money stands behind it. But what we can judge is that the lobbyists – which include many political and semi-political organizations and their people in charge – are cynically and act upon that attitude. This begins with radiation thresholds. Even in the Ukraine and in Belarus, these limits are lower then here (in Germany). There is simply no binding independent worldwide authority. At WHO, there is JUST ONE person, who deals with Radiation! But the WHO has nothing to say anyway. When it comes to radiation exposure and its consequences, they are not allowed to say anything. Since a contract was sealed in 1957, it is subordinate to the IAEA (International Atomic Energy Agency) and therefore supresses all reports about the real dangers of radiation. We have to decry all of this. The IPPNW demands that this agreement is dismissed! Maybe the WHO is able to fulfill its first article: to help all peoples to reach the best-possible health status. The Foodwatch-report of IPPNW (August 2011, German section) states clearly: The determination of limiting values is, in the last consequnce “a decision about the tolerated amount of causualties”. And Now: Japanese Government To Measure Radiation Of Rain And Snow In Fukushima Prefecture … The Results Will Be Released In March! Fact is our planet’s magnetic polar shift is already in process. Earth does change its magnetic poles every million years (plus or minus 200,000 years). Before a change of magnetic field, the Earth’s magnetic field becomes weaker and moves around, like a spinning top would before it falls. The Earth has already had hundreds of changes (flip flops). Scientists know this as a result of studies of magnetism on the sea floor, near the mid-Atlantic ridge. The lava slowly moves out of this crevasse (gap in the sea floor) and then it cools with its iron oxide molecules all pointing in the new direction of the Earth’s magnetic field. We can look at the history of this magnetic field today to look back at the many flips in the past. Reversals occur at intervals from less than 100,000 years to as much as 50 million years. The most recent geomagnetic reversal, called the Brunhes–Matuyama reversal, occurred about 780,000 years ago. Another global reversal of the Earth’s field, called the Laschamp event, occurred during the last ice age (41,000 years ago). However, because of its brief duration it is called an “excursion”. …. Of course. Let’s call it exceptional, outlandish, unusual and maybe even scary, but we must never admit we haven’t got a clue what’s going on.